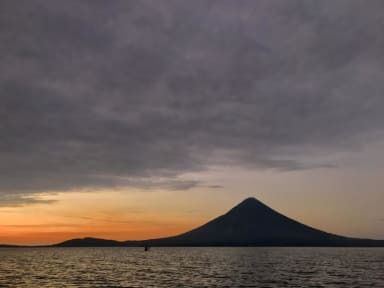 Si necesita trasporte dentro de la Isa de Ometepe bien sea para la llegada desde el puerto al Hospedaje o para tours.. The chocoyos is in front of the Cocibolca Lake, the only lake in the world that harbors marine species such as sharks and sawfish in freshwater, perfect for Kayak, and in front of Volcano Maderas´s entrance, 4 kilometers to the San Ramon Waterfall & 8 k to the Ojo de Agua in Tilgue. We are located in one of the most beautiful spots of the entire Nicaragua, Ometepe Island. From our facilities, you can reach some of the finest spots of the area such as Volcan Maderas, Beach Punta Santa Maria and Reserva Volcan Concepción and other natural spots are near to our facilities. With thick comfortable mattresses you can relax after a long journey in your trip, excursion or enjoy the sites of Ometepe. 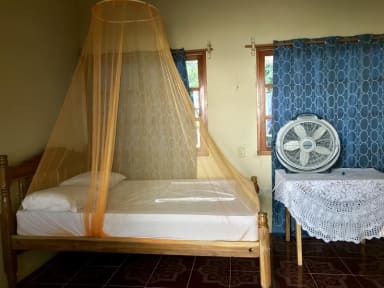 All rooms with fans and internet to make your stay more pleasant. Whether you want to relax watching the beautiful sunsets or bathe in the delicious waters of Lake Cocibolca we have comfortable chairs and chairs. Our dining room offers breakfast, lunch and dinner at the ranch, patio or on the beach. Wi-Fi is free to use. Otherwise, watch a movie on a large flat screen television or listen to music.